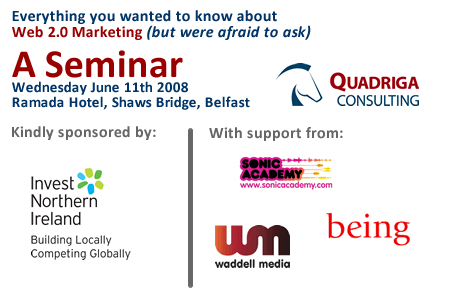 For everyone interested in online marketing here’s a promising web marketing seminar. Ramada Hotel Wednesday 11th June, Shaw’s Bridge Belfast £95+VAT (all day). The event is being sponsored by InvestNI and no doubt some of the bigger development and marketing companies will be attending. Should be interesting, and hopefully I’ll have something to report back on. Apart from a very warm squashed room the seminar was enjoyable and provided plenty of food for thought. Jeff from Quadraconsulting gave the presentation. Blogs, blogging platforms and the benefits of blogging obviously took up much of the presentation. Blogs give website owners the opportunity to engage and create an online relationship with their readers. Nothing out of the ordinary here, though I’m far from convinced that every site should have a blog or that existing static sites should move over to a blog/cms platform. Very quick skim over SEO, touched on inbound links, keyword targeted sites, title tags, and anchor text, and importance of content. Nothing out of the ordinary here apart from the 303 redirect, (What’s that all about? ), might have been nice to spend a bit more time on this subject and have a few examples for those in the room that don’t know what anchor text is or how SEO can benefit your business, but time constraints no doubt. Page Rank isn’t the holy grail of search engine rankings. The higher the PR doesn’t necessarily mean the higher you’ll finish up the Google rankings. Might be a factor though a quick search on Google for a specific phrase will provide plenty of evidence of pages with less PR being returned higher up the rankings. No point in having a high PR if your site isn’t delivering targeted traffic from search engines. Social networks such as Facebook again were covered as another method of online engagement. Not something I’m heavily into but I can definitely see the benefits of targeted groups and networks, though hasn’t this always been the case. There was very little on Google Adwords and the benefits of Adwords. Might have been nice to cover this in a bit more detail. Keyword research was covered and Google Adwords as a great keyword research tool wasn’t mentioned. I can find out plenty on competition, market research, keywords, keyword usage that some of the other tools don’t give.